View More In Cable Ties. This cable tie with self adhesive tape on the back stick firmly, and hard to fall off, If used as the general tie, it can be released more freely. Self adhesive wiring fixing seat is mainly used in computer internal wire organizing, electric communication wiring and fixing, beautiful and generous. Ladder type designed, can be adjusted to fasten wires according to different cable size, and freely release, very practical. 1. Self-adhesive, make sure that the target surface clean and dry,then remove the protection on the adhesive and press the tie mount on the surface. 2. Screw fixation, there is a optional screw hole in center of the base,if somewhere is hard to stick with adhesive, it can also be reinforced by screwing it throw the hole(Not include screws). Dimension: Base size (LxW): 25x18mm; Strap size (LxW): 91x8mm. Adhesive: 3M self-adhesive pads, high cohesive strength and long lasting, can be stick to any flat surfaces such as: plastic plates, glass, iron, wood furniture, glossy cardboard, porcelain, ceramic-wall etc. 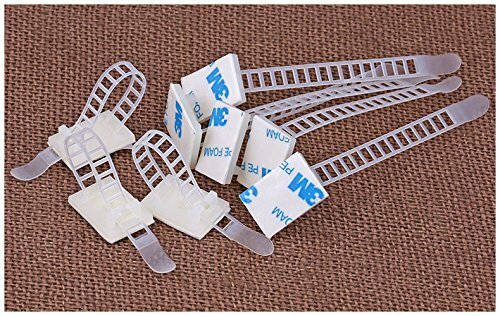 Strap: White cable tie made of UL approved nylon 66, insulated, ageing resistance, ladder type designed, can be adjusted according to the size of the wire cable, and can freely release, very practical. Use: Widely applied to cars, computer, home and office, and used in chassis line management, internal wiring cable engineering, beautiful and generous. If you have any questions about this product by Magic&Shell, contact us by completing and submitting the form below. If you are looking for a specif part number, please include it with your message.